Healers Gold is the name given to a mix of Iron Pyrites and Magnetite found in the Arizona desert. It is also sometimes known as Apache Gold Stone. 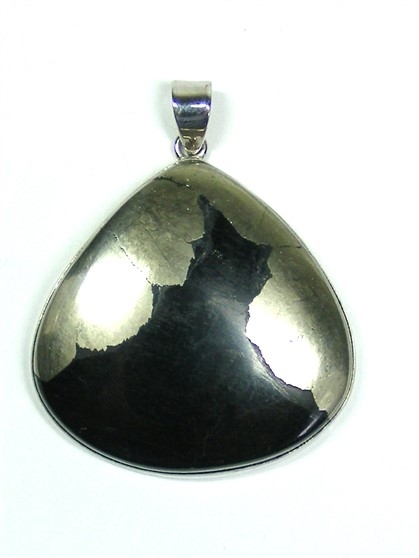 This sizeable pendant features a wide tear drop stone with a wonderful mix of black and gold. It is simply set in sterling silver and stamped with 925 on the reverse. This is a gorgeous, and unusual, pendant. Healers Gold (occasionally also called Apache Gold Stone) may help us when we have trouble getting to sleep, however, once we are asleep it promotes a more relaxed sleep. Healers Gold is believed to strengthen the overall vitality of our physical body and is also thought to help with male infertility. Healers Gold promotes within us a much more positive outlook on life. It enhances our self confidence and our belief in ourselves. It helps us to feel a much greater sense of overall balance and well being on many levels. It helps to integrate both our male and female sides and our assertive and receptive sides. Healers Gold helps us to much more readily accept other people for what they are. It is also said to enhance our creativity, stamina, patience and persistence. As the name would suggest, Healers Gold is particularly beneficial to healers as it helps them to better connect with the energy of the Earth and to channel that energy through their body. This can increase their levels of "prana" or "life force" making more energy available to them with which to perform their healing. In addition, working with Healers Gold allows those who perform healing work on others to do this without their own energies being drained or depleted. At the same time, the overall healing experience for their clients is greatly enhanced. Healers Gold is beneficial to each and every chakra point and it can also help to activate weak chakras. It helps to remove energy blockages and can help to restore our auric field. Healers Gold also helps to protect us from the electromagnetic radiation of electronic equipment and computers.